I live just about 5 miles south of a hotbed of controversy. For those that haven’t heard yet, there is a battle raging nearby. If you happen to live in the United States, most likely it has been on your television at some point in the last 6 weeks. If you think I probably live near Los Angeles, New York City, or some high-profile area such as that, you would be wrong. I live just a few miles from King, NC. King, NC, you might say…where in the world is that? Granted, if you haven’t seen it on television, and you don’t live near me, you probably have no idea where King, NC is located, or why there is such a problem going on here. King is the larger town in the area. They have several traffic lights, where our small community, just a few miles away, only has three. The controversy taking place is no small matter. It has been fought in different circumstances and in different places other than this, and it’s a good cause. About six weeks ago, on the complaint of one man, and through pressure from the ACLU and the Americans United for Separation of Church and State, the King Town Council decided to remove the Christian flag from the Veteran’s Memorial in the town park. 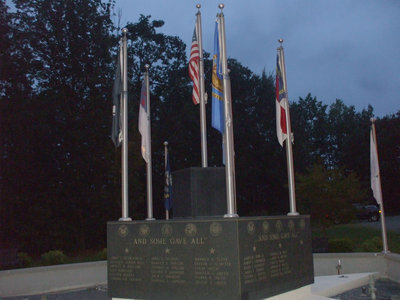 The Christian flag has flown alongside the American flag and the flags of the branches of military service ever since the memorial was built. Honestly, I do feel for the town council of King. The majority, if not all of them, are Christians themselves, and I’m sure it was a tough decision for them. Citing the financial inability to fight a lawsuit with the ACLU, and on the advice of the city attorney, they felt they made the only decision they could. But, when the decision was made and the flag removed, Christians immediately began to take notice, and take a stand. Christian veterans obtained a permit to place their own Christian flag at the memorial, and personally guard it 24 hours a day. There have been many gatherings to lend support. At the beginning of October, Running the Race for the Prize Ministries (a ministry I am very blessed to be part of) organized a peaceful prayer walk at the park, where several hundred were in attendance to show their support for the cause. There was no protest, although some people stated there was. It was simply an opportunity for supporters to gather and pray for God’s will to be done in the situation. All of these gatherings and smaller rallies were preludes to the ‘big one’…the rally that took place this past Saturday, October 23rd. I was unable to personally attend this one, but have seen reports and pictures from it. Calvary Baptist Church, approximately a 30-minute walk from the park, was the staging area. The crowd walked the distance from the church to the amphitheater at the park, and had a rally with several speakers to support the reinstatement of the flag. A representative of the Christian Law Association in Florida was even on hand to give a statement. People from as far as several states away drove hours to attend. When I heard the reports, and saw the pictures, there was one thing I wasn’t quite prepared for…the thousands of people I saw that had gathered in pursuit of one common cause. Frankly, I was stunned. I expected many to attend, but the number has been reported to be over 5,000 people. The local news website stated prior to the event that they expected several hundred, possibly even 1, 500 people, so the numbers far exceeded even their expectations. One thing I’ve seen throughout the whole ordeal that I admire is the fact that the organizers for all of the gatherings, the walk, and the rally have insisted that this is not the place for protest or bad behavior. The emphasis has been put on Christlike behavior, and faith in God to deal with this situation. The earlier prayer walk, and the latest one, were largely silent treks, where participants were urged to pray for their leaders and for God’s guidance. Protest signs were not allowed…only hearts that long for a peaceful, victorious end to the situation. After the big rally was over, I was mulling it all over in my mind. The most touching thing to me overall, and honestly, the thing I believe pleases God the most, is seeing people that call Him Savior and LORD coming together. Regardless of denominational affiliation, or lack thereof, thousands marched that day in one mind to champion a common cause. As I thought on this, I began to ask myself some hard questions…none that I have the answer for. If we can march and rally in support of the Christian flag, what hinders us from gathering for other, equally as important common causes? Why are denominational lines often so prevalent when it comes to ministry? There are some very compelling and dire needs in our communities…needs that the church is in a wonderful position to influence. If 5,000+ of us could get together, regardless of church affiliation or doctrine, to reach out and touch people personally in ministry, we could be such a powerful influence in our communities, the enemy would find it very hard to stop the move of God that would take place. The world is waiting on us, the church. Yes, we should absolutely take a stand for the Christian flag, and pray for its reinstatement. But, what if we consider spreading this momentum to other areas of service, in turn showing the world that we are truly born of God? This is how the world will know we are truly His disciples, by our love one for another (John 13:35), and our unselfish service to others. The town of King, NC has made a great showing so far…can we take it further to influence the kingdom of God to a greater degree? I truly believe we can!